The description of the protein. The NCBI taxonomy ID for this protein. E.g. 9606 for human, or 4932 for S. cerevisiae. Used for taxonomy-level filtering in the ProXL web application. If not present, or set to 0, the species name will appear as "Species Unknown" in the web application. Annotations for this sequence from the sequence database used to search the data. 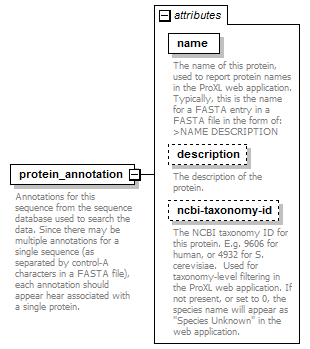 Since there may be multiple annotations for a single sequence (as separated by control-A characters in a FASTA file), each annotation should appear hear associated with a single protein.